The art of sailing is well over a thousand years old. In this case the sails help a train operate at lower cost. As A train needs to stop at each station useful energy can be extracted from slowing it down. In front of a conventional train a row of carts is attached. Each cart holds a sets of solid sails roughly half the height and about the same width as the train. As the combined size of the sails needs to make sense with the weight to be pulled and how much wind is available, the number of carts is variable. The sails capture momentum and generate energy just like a windmill. In ideal circumstances transportation could become a novelty, the volume of generated energy could be large enough to do useful work without any passengers. I seek to store this 'excess' energy mechanically to lower the losses. Originally I thought the transformation into 'useful' electricity could be done at the train-stations, as conventional trains already generate electricity while breaking there is no need to build extra generators. This does put large limitations on the size of our sails. 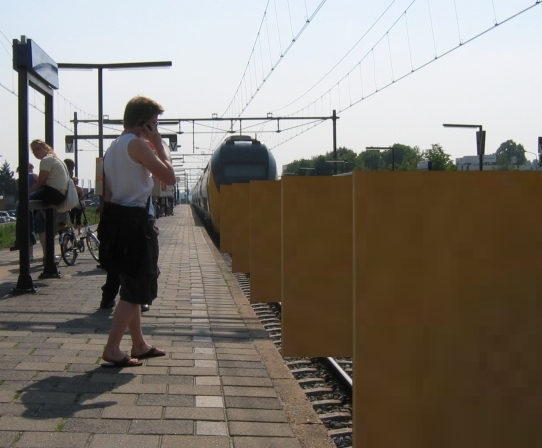 The person 'driving' the train also needs a reasonable clear forward view. Putting the sails on top gives problems with cables bridges and tunnels. Springs and flywheels also present an additional medium to store the 'gain' in mechanical energy onto. This can be useful for fast acceleration. The rails will take less maintenance as acceleration isn't translated true the wheels but when more energy is extracted as needed to propel a normal train the breaking may cause undesirable deformation of the rails. This final annoyance will mean the wind creates an unequal wear in both directions. 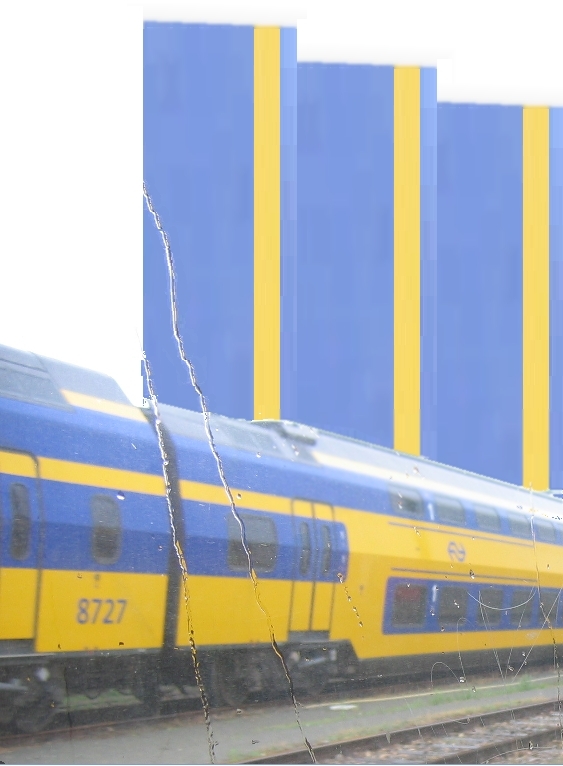 Do you have any clue as to how much a train weighs? how much HP is needed to move one? But of course I do. 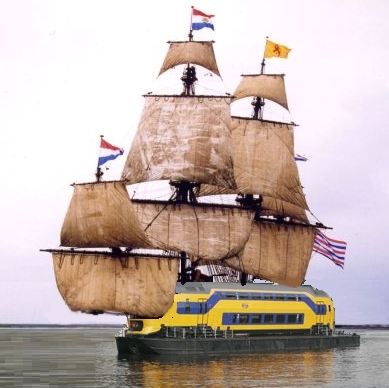 The idea is to use conventional trains and use the sails to assist. Electric trains can generate about 30% of the energy used to accelerate while breaking. If (on average) we could shave of (only) an extra 10% the sail would already be interesting. For now I think additional carts with solid sails attached to the front and rear of the conventional train is a good solution. I'm trying to picture how a train is going to tack upwind. You just lay track 45 degrees to the direction of the next station, and then put in a 90 degree turn halfway there. The train will have to tack. 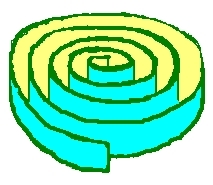 Add in a direct line without a turn, plus another right angle track on the other side, and the train should be able to sail to the next station regardless of the wind direction. That is, as long as your switchman can read the wind. And the best part about it is: NO LEEWAY. Why not use the sails as a wind turbine to drive a stationary generator, that way the vehicle can be lighter more streamlined, and powered by electricity which can be efficiently transmitted over long distances. I think the sails on the train don't prevent any windmills from being placed. I don't think transformation and transportation of wind-energy is efficient compared to using it on the spot. Like carrying water to the sea.